Evo & Grace: The WanderLusts: 7 Things to do at the Mountain Lake Resort. The TravelBook.ph’s Blogger Getaway. 7 Things to do at the Mountain Lake Resort. The TravelBook.ph’s Blogger Getaway. Laguna is the historical province of Southern Luzon and home of the biggest lake in the country and promising artworks and handicrafts. It also has the rural ambiance near Metro Manila with breathtaking sceneries of mountains and magnificent seven lakes. As part of the Travel Bloggers Getaway program of TravelBook.ph, we had a chance to explore the unearthed beauty of Caliraya Mountain Lake Resort in Cavinti. It is where you can find the mountains and its majestic lake as the showcase of promoting ecotourism and communing with nature. This prime resort that is owned and operated by three major real estate companies namely The Atlanta Group, Sta. Lucia Estate and Fil Estate is now a haven for outdoor lovers. This is for those who value the greeneries and its inviting climate against the polluted cities. Originally, it is planned for residential project that could have developed into a destination that offers sports and recreational facilities. Mountain Lake Resort has a total of 700 hectares of land divided into a Golf course, Residential and Marina Sports Area. But its priceless attraction is their manmade lake created in 1848 by an unnamed American Engineer that comprises the 30 hectares of Marina part. The main Clubhouse with 21 hotel rooms started its operation in 2005. After ten years the sports area of Marina was made. No wonder, this is the main attraction or activity as of now. This pleasurable sport is so far the priciest product of Mountain Lake Resort. It covers 70 hectares of land designed by Arnold Palmer. This is a major attraction for foreigners or even locals who can find solace in making a hole-in-one. This is the exciting part, where stamina and endurance test is the byword for anyone who will avail of in-water obstacle course. Perfect for any team building events or group tours. The Marina Sports area can host around 200 people. They have villas for families or groups. Plus, it is where the Glamping (Glamorous Camping) is located. Many things to do here. You can divide your group and challenge them to numerous stages that will boost not only their morale, but also camaraderie. These courses are Slide Drop Climb Drop, Wall Climb Slide, Cable Balance, Karate Kid Challenge and Tarzan Swing. We call it our Sige Sa mantsa advocacy, where getting dirt and bruises is an accomplishment. What I loved in this area is the view of the majestic lake, it is relaxing to the eye plus of course the fresh air it offers. Make sure to try also the Zip Line and the fun hanging bridge. Photo by Jena Mae Nacar. I’m used to kayaking in the beach. But in Caliraya Lake, it is different. It’s quite short but worth the experience. Beds of grasses will make you curious why you skipped Botany class and naming it is a challenge. Even though it is fresh water, it doesn’t smell. It’s still fresh as the first rain on summer of May. Navigation skill is required in paddling and swimming with ducks. Swan boat ride will make you giggle like kid again, bumping others in the open lake area. 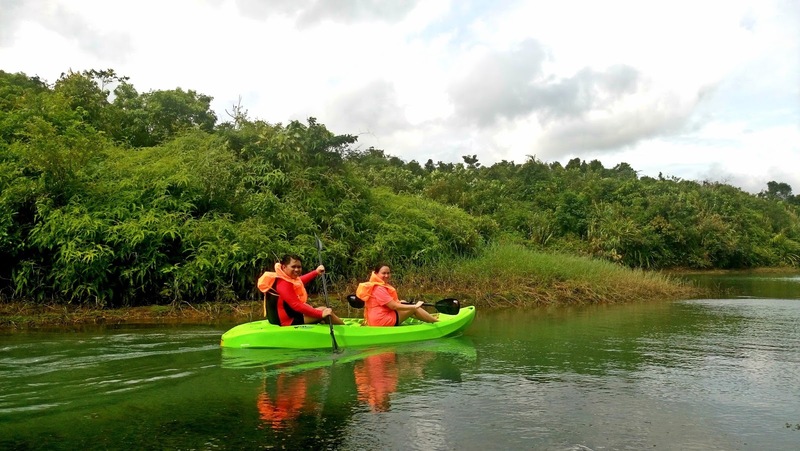 Like a kid playing, you roll over the pedals and explore the other side of Caliraya Lake. The ride is perfect for couples. It’s best to try this while sun is setting to get the best view of the lake. The highlight is the ATV (All Terrain Vehicle) ride. So far, this is the most adventurous that Mountain Lake Resort can offer. 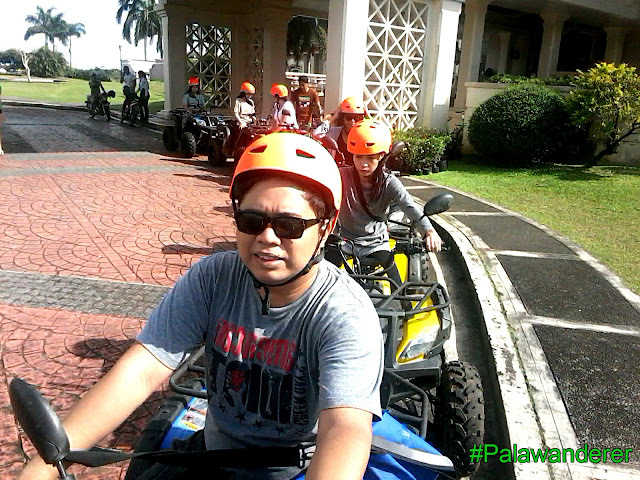 It also has another package of riding ATV going to Cavinti Caves. You don’t have to be a motorcyclist to run or drive it. What’s exciting is the road that you will go through is muddy and rocky. A destination is not complete without the food. The supreme attraction for every resort is finding comfort food for your tumm. Mountain Lake Resort will not fail you on that. It’s a must I say to try their version of Bulalo (Filipino Beef Marrow Stew). Its tenderness, no greasy taste at all. Believe me, it’s one of the best tasting Bulalo I’ve ever eaten. Dory Fishing is an added attraction in the Marina area. It is a home for Dory schools to which it is a delicacy they offer. The one stands out most is their Grilled Dory with Burito Sauce. Resort Manager Jessamin Apora explained to us that it is their own sauce and it is one of their top secrets. Apora said that they only serve the freshest catch of Dory per day. She clarified that Dory and other fresh water fishes they offer are captive and not in a pond or part of any farming technology. Bulalo and Grilled Dory are their bestsellers. 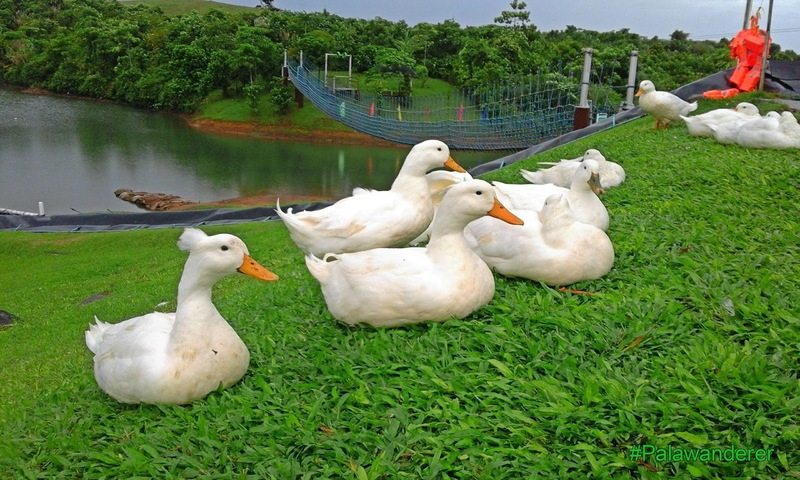 This immaculate white Ducks are the ones who will complete your stay in Mountain Lake Resort. They are so refreshing to see once you wake up in the morning. It’s part of their package to feed them for a minimal fee. Apora said they started growing ducks with only six and she clarified that they are not part of their menu. These ducks are free to roam around the lake and it’s a therapy to watch them swimming and lining up the hill. For rates, and more information about Mountain Lake Resort you can find them in Facebook via calirayamountainlake and for bookings and checking their price, please click this MountainLakeResort from Travel Book Ph. This three-day blogger getaway is organized by TravelBook.ph Blogger Affiliate Program in partnership with Mountain Lake Resort - Caliraya. Special thanks as well to our generous sponsors, Céleteque Philippines, Alfox Printing Services, Century Pacific Food, Inc. (555 Tuna), Vivo Lumio, Cetaphil Philippines, Mystery Manila, Totem Philippines, Escape Hunt Manila, LazerXtreme, Sidlan, and Zalora Philippines. Travelbook.ph is an online hotel booking service dedicated to offering great value hotel booking for every juan. If you want to earn and score free blogger getaways to different Philippine destinations, be a TravelBook.ph Blogger Affiliate by signing up at affiliate.travelbook.ph.